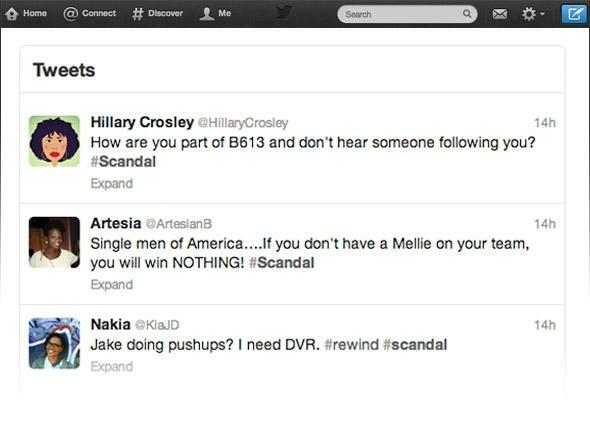 Scandal and Twitter: Can you watch ABC’s drama only on social media? Can I Watch Scandal by Only Reading Twitter? Maybe TV’s most-social drama is so tweetable that I don’t even have to watch it. Every Thursday night, ABC’s Scandal takes over Twitter. While Shonda Rhimes’ gonzo soap opera, set in a Washington, D.C. so putrid, corrupt, and full of murderers it makes the real D.C. seem like heaven, airs, 2,200 tweets about the show go out per minute. (At least that was the measurement in February, and the show’s ratings have only gone up since then.) Last week, as I watched Scandal while scrolling through Twitter—my de facto method of consuming Scandal—I wondered if I needed the TV at all. How much of Scandal would I miss if I just “watched” the show on Twitter? I decided to find out. When last night’s episode “Icarus” came on, I sequestered myself in a TV-less room and read only these Scandal-centric Twitter lists. Then I wrote down what I thought happened. And only then did I watch the episode to see what I missed. Spoiler: I missed almost nothing. Scandal begins with a flashback, starring a young Olivia, wearing glasses and eating cereal (“Lil Olivia likes Fruit Loops!”) talking with her mother, who dresses a little bit like grown up Liv, cooks casseroles for dinner, and is played by Khandi Alexander. When the flashback is over, Olivia arrives at the White House to confront Fitz directly about the plane her mother died on. Mellie is under the mistaken impression that Olivia is there to agree to run Fitz’s presidential campaign. And greets her with a “Welcome home.” (“Scandal, for that awkward moment when your wife welcomes your mistress home.”) But when Olivia asks the president about Operation Remington, he pulls rank, refusing to answer. Olivia tells him “I can’t work for you,” and leaves. Mellie does not feel culpable for Olivia’s rejection: “I did everything but roll your whore up in a rug and unfurl her at your feet.” A Rick James song plays either now or in one of the next scenes for effect. Those scenes include: Quinn at a shooting range; Olivia agreeing to run the campaign of Josie Marcus (Lisa Kudrow); a fundraising montage, in which Olivia gets tons of money from Big Sugar; Olivia asking Jake for more information about Remington and her mother; VP Sally Langston and her campaign adviser plotting in some capacity; Cyrus and Olivia’s father conspiring; Jake turning down a woman named Kate who hits on him but is actually a hit-woman. Back home, Olivia is drinking a loooottttttt of wine and watching footage of her mom’s plane crash. Which seems like a good time to call her father (“Drunk Dialin Daddy”), who either in this scene or a flashback has a mustache that looks like Eddie Murphy’s in the ’80s. “What was the last thing you said to her?” she asks him. He replies, “Have you been drinking?” (“Is Scandal a comedy now?”) “I have so many questions I want to ask you but I’m afraid you’ll kill my friends if I do,” Olivia says. Eli offers her reassurances, with his fingers crossed, and tells her she can ask one question. She asks: “Did. You. Kill. My. Mother?” (“Special five-part episode of Scandal where Kerry Washington says one word a week.”) Eli denies it, tears up, and suggests someone else might have had it in for Maya. At this point, Seagram’s Gin tweets that Olivia Pope may need something stronger than wine, which seems accurate. On the campaign trail, Olivia is explaining to Josie that she is too nice: “Nice doesn’t get you president unless you want to be president of Candyland.” Josie doesn’t really want to hear it: “Stop trying to make me someone I’m not!” But then an attack ad gets Marcus good and riled up, and she vehemently defends herself along feminist lines. It works out well for Josie, but it’s all thanks to Olivia: Pope and Associates concocted the attack ad and blamed it on Reston. Meanwhile, Mellie is a Tar Heels fan and gets hit on by Sally’s husband, who stares at her cleavage during a church service. Quinn, wearing all black, meets up with assassin Charlie at the gun range. Then, in a very heady sequence, Jake goes from doing push-ups (“OH HELLO JAKE DOING PUSHUPS”) to almost being killed by that woman he met earlier. She is foiled—by an employee of Fitz’s—and dies. But Eli quickly gets to work recruiting Quinn to replace the dead asset. In the episode’s last scene, Fitz arrives at Olivia’s apartment (“Bye-bye Jake.”) “There is nothing you could do that I wouldn’t forgive,” he tells her. He admits to shooting down the plane. Olivia then informs him that her mother was on it. “I was 12 when she died. I was 12,” she says. Fitz had no idea. He gets emotional. (“That time the president came over and cried a little.”) Tony Goldwyn does impressive work as an actor. Olivia can’t forgive him. She closes the door on him. The end. So, to brag, I nailed that. That is a pretty accurate (and exhaustive) description of last night’s episode. I certainly got some things wrong. Twitter is the place to read jokes about a TV show, but when the show is as outrageous as Scandal it can be hard to tell the jokes from the facts. I don’t think Harrison really was a used car salesman, Eli didn’t have his fingers crossed, and Olivia said, “Did you give the order to have my mother killed?” not “Did. You. Kill. My. Mother,” though, obviously, the latter is way preferable. The shorter the scene, the more minor the characters involved, the less Twitter tweeted about it. I also missed some big things: Fitz did not confess to shooting down the plane, he just looked really distraught when Olivia told him her mother was on it. And Sally’s scheme to get support from the religious right for her presidential bid went completely over my head. She and her husband had dinner with Mellie and Fitz as part of that strategy, which means her husband didn’t look down Mellie’s décolletage in a church—he looked at it while saying Grace. Also missed on Twitter: the poignant look of comprehension that flashed on Mellie’s face when she saw Sally too has a husband who cheats. The subtleties don’t make for great tweets. And that points to a problem with the way many of us watch TV. Twitter is ideal for amplifying big moments—the most common tweets I saw were some variation on “Whoa, did that just happen???! !”—but though Scandal is full of those WTF jolts, Twitter makes it seem like it’s only full of WTF jolts, which has the unintended effect of making all those moments seem like less of a big deal. (If there are four “lines of the night,” maybe one of them wasn’t a line of the night.) But Scandal is good enough to want to share because of its nuances as well as its shocks, even if the nuances don’t make it to Twitter. Because I wasn’t watching on television, I missed that sad look on Mellie’s face, the way Olivia scrunched up on the couch like a little kid, and the desperation apparent in her increased alcohol intake. But if I had watched in my typical way—2/3 TV, 1/3 Twitter—it’s likely that some of those moments might have whizzed past me anyway, because, you know, I was reading Twitter, which amplifies the crazy. That’s part of the fun, of course. Spazzing out about Scandal is the essential part of the shared Scandal experience. But it was nice to be reminded of the subtle details that make Scandal a good television show and not just a series of histrionic events. So: If you are ever stuck somewhere with the Internet but no television and you absolutely must know what is happening on Scandal, this is the option for you. But otherwise, watching Scandal on Twitter is not nearly as much fun as watching it on television. It is one thing to read on Twitter that Harrison has an “epic tie.” It’s another to see it in all of its resplendent, multi-colored polka dot glory. It’s one thing to read that Tony Goldwyn’s face fell really convincingly. It’s another to see his eyes just begin to well up. And it’s one thing to read that Jake is doing (totally extraneous) push-ups. It’s another thing to see him. Doing. (Totally. Extraneous.) Push-ups.